Rentals are confirmed with a 50% Non-Refundable & Non-Transferable Deposit. Rentals must be paid in full 30 days before your event. Lighted candles must have mirrors underneath them to avoid getting wax on tablecloths. You will be charged $15 per tablecloth if wax is spilled on them. Upon signing the rental agreement, renter will be required to pay 50% of the full rent cost. The balance must be paid 30 days before the rental unless agreed to in writing by Bowling Green Weddings. In any case, all cost must be paid before any items are installed for your event. A $50 damage deposit is required on all rentals. If no damage, your deposit will be available to you in 72 hours after your event. If Bowling Green Weddings is doing your set-up, you must provide adequate time to complete the set-up at your expense. Most large weddings involving 200 or more guests require 5 hours of set-up time. Tear-down after the event requires 2-3 hours. 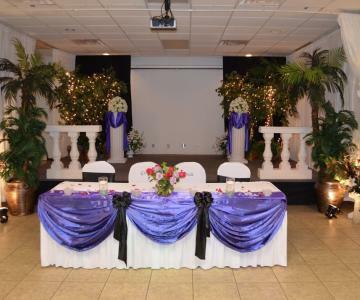 You must notify BG Weddings 1 week in advance of your event with the set-up and tear-down times. The time needed to install drapery on all the walls ranges from 2-3 hours. Please call Bowling Green Weddings at 270-799-7540 one hour before your event ends so we can start the tear-down. Please do not throw dirty linens on the floor. Please place in large plastic bags after all the food is shaken from tablecloths. Please place napkins, chair covers, and runners & sashes in separate bags. Skirts and drapery should not be put in plastic bags. If you require labor to help during the reception, the hourly rate is $25 an hour per person. My goal is to make your wedding as beautiful and care-free as possible. If you are dissatisfied with my work, please let me know as soon as possible so I can rectify the situation in a timely manner.